Manufacturer of a wide range of products which include chainless mercerizing machine and chainless fabric mercerizing machine. The Chainless Mercerizing Machine are so-called, because there is no fabric stretching by clip-chains in this type of machines. 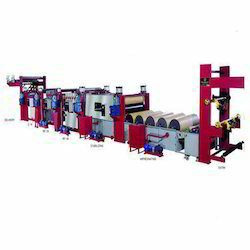 The underlying principle in these machines is to apply tension to the fabric before and during the mercerizing process and not to allow the cloth to shrink, till it reaches their stage when shrinking does not take place, with a view to achieve satisfactory mercerizing results with reasonable production speeds. Very little maintenance is needed for this machine on operations working days as it is simply manufactured. It improves luster and increases fabric strength. It has direct and indirect heating arrangements. We are one of the preferred choices in the market that is engrossed in offering Chainless Fabric Mercerizing Machine available at reasonable rates. 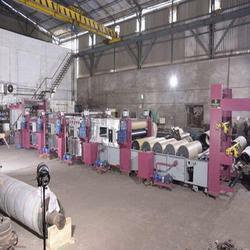 Owing to the durability, operational fluency, ease of operation, minimal maintenance and economical rates, these machines are widely demanded in the industry. Awning fabric machines offered by us are provided in multiple specifications to fulfill varied client needs. Looking for Chainless Fabric Mercerizing Machine ?